21902LF-SS is rated 4.3 out of 5 by 84. Rated 5 out of 5 by Beans from Nice look! Very pleased!! Would purchase again!! Rated 3 out of 5 by Handyman from Not sure yet Installation a snap & that's NOT a good thing. Where the sprayer "snaps" together it leaked & no way to take it apart or tighten - it only snaps/poor design in my opinion. Delta is sending new part, but I had to take photos & put them through Adobe to get them the right size, etc. to send - a pain/wouldn't take my word for it even though I sent them the parts # needed in initial e-mail. We'll see if the replacement part leaks too. Rated 5 out of 5 by janice from easy to install, works great I purchased this a couple weeks ago, was a snap to install, It works great and looks great also. It is the only company that truly stands behind their products and the consumer. I would not buy anything but Delta products. Rated 1 out of 5 by The Pinkerton from Good looking. But my one issue is now two. I bought this faucet a couple of hours ago to replace my leaky one that couldn't be rebuilt. Install was as easy as any other. The unit feels solid and everything moves smoothly. But the thing has a slow drip from the hot side that can't be convinced to stop just by fiddling with the handle, which I could accomplish on my old faucet. 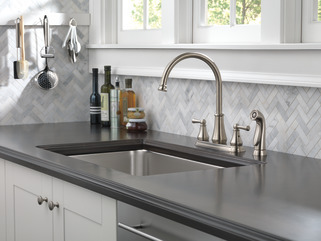 The hand sprayer works as long as you don't move it, if you move it, it leaks from the quick connect under the faucet. The quick connect apparently had a quick R&D. I'll be returning it within 3 hours of buying. Rated 3 out of 5 by Bob68 from Easy install The faucet was an easy install. Everything works great. One big problem, I have had this faucet in for about 2 weeks now and I am getting a metallic taste to my water still. I have run alot of water through the facet but the taste is still there, have to get water to drink from the refrigerator. Rated 5 out of 5 by Shirlc from Great price! And looks fantastic! Great price! And looks fantastic! My Plumber suggested Delta when I mentioned I wanted to replace my faucet. I went and looked at Lowe’s and wow! The variety was fantastic and the prices were very reasonable. When he saw that I had purchased a Delta product he was very happy. I had never seen him smile until then. He said they were very easy to install the quality of the items was just off the chart and the company knew what they doing when they put it in them together. I am trying to install a Brita Water Filter to the faucet. How do I remove the aerator and get connector? I do not have the wrench that came with the assemble since I just moved into this house. I want to install a Brita water filter, but it does not look like any of the connectors will fit and I do not know how to get the aerator out. Can I just pop it out with a screwdriver? Thank you for your question. Delta Faucet model # 21902LF-SS has a cache aerator that needs a wrench to remove it. The part number for the wrench is RP46858 and can be ordered and purchased from your local wholesaler or retailer. There is also an adapter that can be purchased to convert your cache aerator to a 55/64&quot;-27 male thread. That part number is Delta Faucet model # RP51505. recently purchased and installed this great faucet - thank you! Now, I need to attach a PUR filter to it - none of PUR's standard adapaters work with this faucet :(. Please provide thread specifications for the faucet so i can special order an adapter or perhaps Delta makes adapters for faucets with non-standard threads??? thank you! How are the handles removed ? Thank you for your question. 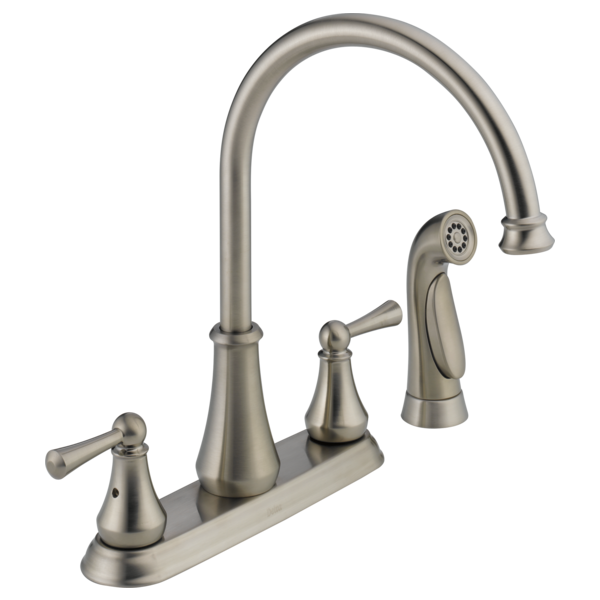 Delta Faucet model # 21902LF-SS requires 4 holes for installation and the escutcheon plate for a complete faucet. Where can I get the Delta aerator thread size 21.5x1-6G so that I can use my Pur filter? You need to either supply Pur with the info they could use to make an adapter to fit this faucet, or change the threads in it so that it will work. I won't keep the faucet if I can't use the Pur with it. Very disappointed. Wish the box would have said that it can't accommodate the Pur. Thank you for your post. 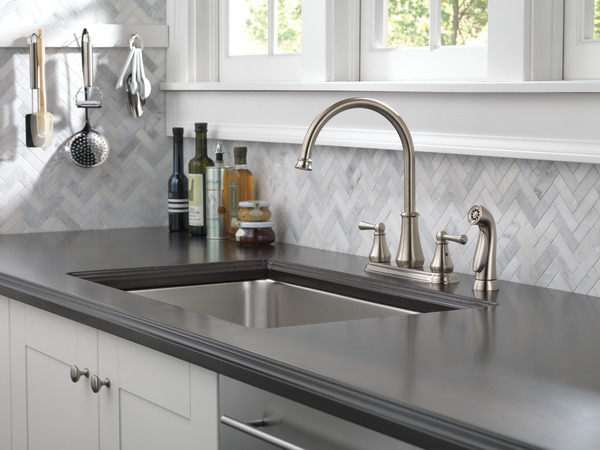 Delta Faucet model # 21902LF-SS does come with an aerator with a thread size of 21.5 X1-6G, and if you take that information to your local retailer or wholesaler, they should be able to provide you with an adapter. Delta Faucet does not manufacture one for this model. The manual lists rp78201 cartridge but I can't find it with Google for sale anywhere. Is there a replacement part number for substitute cartridge? Is there a swivel aerator available for my faucet? I am looking for an adapter to attach a pur faucet filter to this model. The ones that came with the unit don't fit. Thank you for your question. 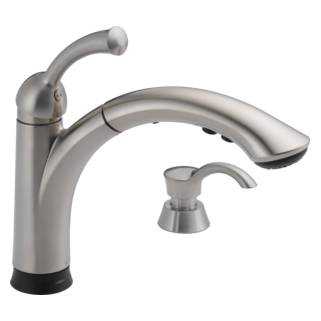 Delta Faucet model # 21902LF-SS has an aerator with a thread size of 21.5X1-6G.